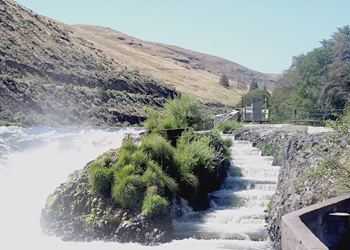 The Sherars Falls Adult Salmon and Steelhead Trap is located at river mile 43 on Oregon's Deschutes River. The trap captures an unknown proportion of adult fall Chinook salmon and summer steelhead that are passing over Sherars Falls. A fish ladder was constructed around Sherars Falls in the 1930's to enhance natural passage above Sherars Falls. During the 1970's, researchers designed and installed a fish trap in the top portion of the fish ladder to conduct annual monitoring of Deschutes River salmon and steelhead. Since 1977, we have estimated the number of summer steelhead and fall Chinook that pass upstream of Sherars Falls by marking all adult fish captured with a Floy tag and later recapturing marked and unmarked salmon and steelhead at designated locations in the upper river. Sherars Trap is typically installed mid-June and removed early in November.